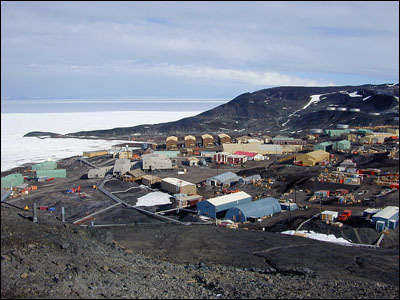 You would think that being in Antarctica, and only 850 miles from the South Pole, we would have been assured a white Christmas. Not true. 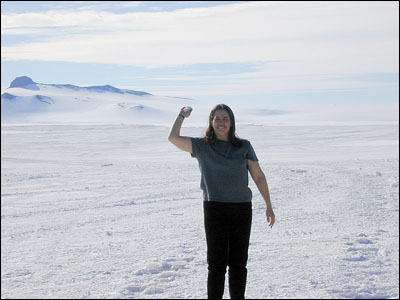 This is our summer and McMurdo Station was anything but white. It was dry and dusty and, relatively speaking, rather warm. I was outside Christmas day in short sleeves and a pair of jeans. The real temperature was around 35 degrees and sunny, and without a breath of wind it was quite delightful. Christmas morning several friends came over to our room and brought all their presents. No one had too many presents, but with all of us together it seemed like a lot. There were 8 of us so it felt like a big Christmas. It was nice. 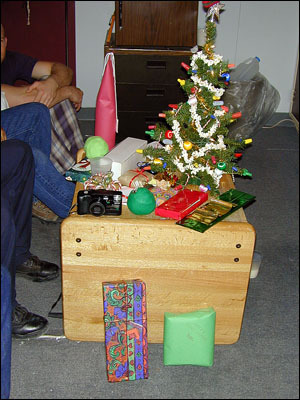 After we finished opening presents we watched National Lampoon's Christmas movie and all laughed a lot. Everyone finally went home around 2:00 P.M.
Patrick, our friends Josh and Martha, and I went to Christmas dinner at 4:00 P.M. 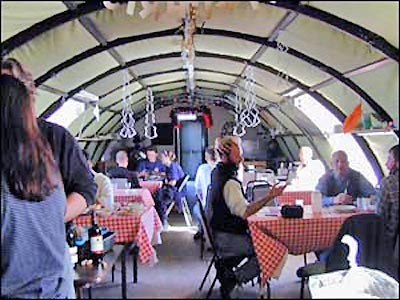 The galley had dinner seatings at 3, 4, 5, and 6 and you had to sign up in advance. 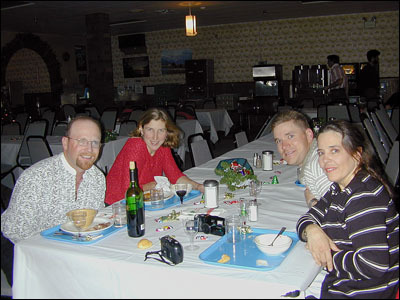 They served rib roast, Antarctic cod and many trimmings. They really outdid themselves. It was a delicious meal. We took a bottle of wine to have with dinner. The day after Christmas was Sunday so we had another day off. 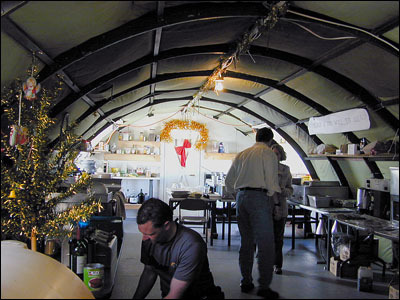 Some of the people working out at Willy Field had their own Christmas party, and so that they would not conflict with other celebrations in town, they held it on Sunday. Most of the people working out at Willy field now are working with the Long Duration Balloon team. They will be launching two enormous balloons with different payloads to study the sun and other things. I was invited out to join them so my boss let me take the truck. There were about 30 people there. We cooked our own meal so we went down in the freezer and got a ham, a turkey and many other things. Some people made pies. It is nice to get the chance to play in the kitchen for a change. 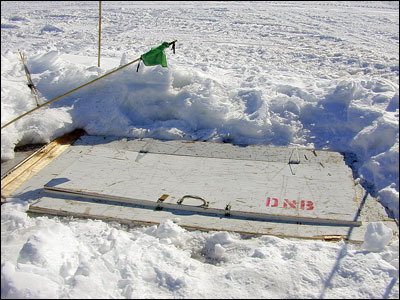 The freezer is just a huge hole dug into the ice sheet with a door on top. There are about 10 steps carved into the snow leading down into it. We were out there most of the day and night and had a very nice time. We played frisbee outside while we were waiting for dinner to cook. The weather was so warm that we were all in t–shirts. Really nice. Of course by the end of the day the wind kicked up and it got really cold. And out on the ice sheet we had a white Christmas because of course it is always white. Nice day. 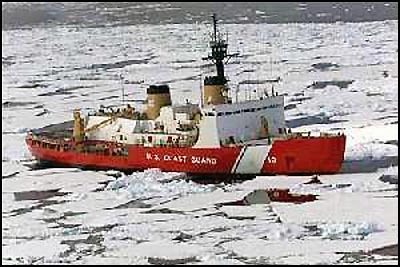 A few days after Christmas the Polar Star, the Coast Guard ice breaker, came into the sound. That was very exciting. The sound was still frozen although it had been off limits for a week or so as the ice was getting thin. To see this huge ship out there was amazing. Of course once the ice is broken up there are seals and penguins galore coming out of the water. I am told that the whales will not be far behind, but I haven't seen any yet. New Years gave us another long weekend. Some friends and I had signed up for the Chili Cookoff contest so Friday afternoon we had to go pick up all of our supplies. We had had to turn in an ingredients list to the kitchen and then they filled it for us. We got our ingredients and stored them up at the shop. I did not do too much on New Years eve. There were several parties, but I didn't really want to go to them. I stayed home and watched a movie with some friends and then at 10 P.M. we went to the chapel where they were showing the Italian film "Life is Beautiful." I had seen it before but wanted to see it again. There really was not much excitement in town. 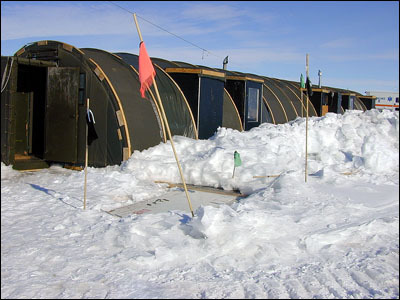 All of the news teams were at the South Pole rather than here. And of course we had no fireworks because with our arid climate things like that are outlawed here, but don't forget that the sun never sets so midnight was as bright as noon. All in all it was a nice evening. New Year's Day we got up early and got busy on our chili. New Year's Day was VERY cold. Summer is a fleeting season down here, but glorious while it lasted. 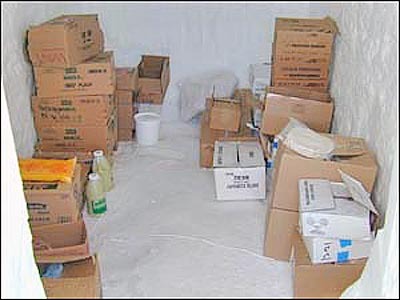 We were each given a millvan, which is a big storage container, to prepare our chili in. We could not begin until 9 A.M. and the judging was to be at 2 P.M. Not really enough time for a pot of chili, but you do what you can. I was glad to have the millvan because it at least got us out of the wind. 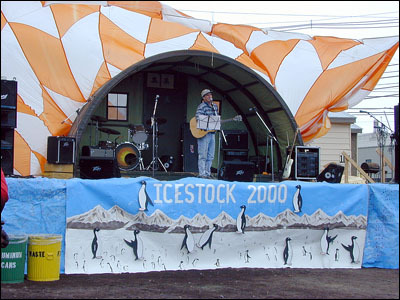 Also scheduled for New Year's Day was what we call Icestock mdash; the local version of Woodstock. I am constantly amazed at how much talent is down here. 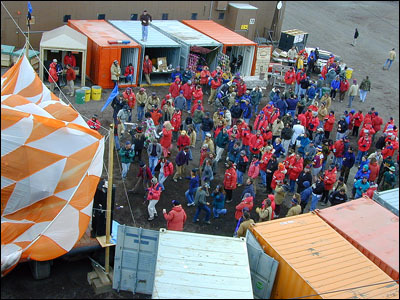 A portable stage was set up with a sound system. They did not set up any lighting as it was bright daylight and they really do not have any theatrical lights down here. There were all kinds of performers beginning with bagpipes at noon and finishing up around 5 P.M. There were violinists, rock bands, Celtic bands, singers, yodelers — all sorts of things. It was really a nice music festival. And of course the audience could go around and sample chili from 8 teams. 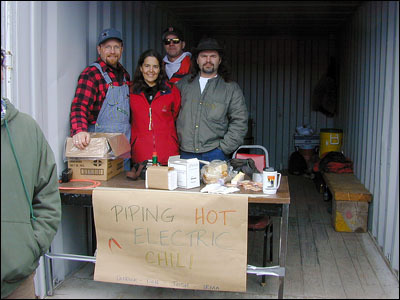 I am not sure what the judges were looking for, but they chose the team with the hottest chili. However, most of the crowd kept coming back to us for 2nds, 3rds and 4ths, so we had the most popular. That made it fun for us. We had Sunday off again, so my friends out at Willy Field invited us out to celebrate the New Year. This time we made all kinds of pizzas. They were good as we could make our own with whatever toppings we wanted on them. It was not as cold as Saturday, but still cold. All in all the holidays were pretty nice. Today the whole town went "Daisy Picking." Once a year everyone gets off work and we all get together and clean up the town. We were assigned areas around our work centers and we worked about 3 hours picking up litter and trash and getting rid of it. While people here are very litter conscious and the town doesn't generally look too bad, I have to say that things do look a lot better now.